The Fly Fishing Cottage is your cozy little Montana escape, located 2.5 miles north of Big Sky on the banks of the famed Gallatin River. This one-bedroom and one-bath cottage is calling all fishermen! Just three miles away from Big Sky Town Center which offers numerous shops, restaurants, free concerts in the park, movie theaters, farmers market and much more. Continue on a short drive to Big Sky Resort for shopping, restaurants, hiking trails, mountain bike trails, lake, spa, and Zip lining. The best part about this Cottage is its’ location! From here you have ultimate Gallatin River access to some of the best fly fishing in America! You’re also just a short drive away from the town center and Big Sky Resort that has tons of fantastic shops, restaurants, and bars. Yellowstone National Park is a 50-minute drive away too, so there’s always something new to explore! - Amenities include a wireless internet, flat screen TV, and kitchenette. 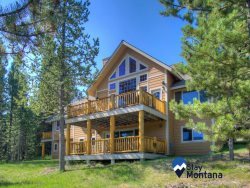 - Outstanding location – Gallatin River front, 5-minute drive to Big Sky Town Center, and amazing mountain views!